One of the primary questions for agile teams adopting a new approach such as Scrum is whether to start with principles or practices. Agile methods seem to make this more complex by emphasizing adaptability, so following a process blindly just seems wrong, but this can lead to a team appearing to follow an agile process while not actually realizing any of the benefits of agile—with predictable frustration. Principles are abstract, so it’s too easy for teams to make minor adaptations to their current practices to provide a veneer of agility. Sometimes the best way to learn principles is indirectly, through practice. A classic cinematic example of what I’ll call indirect learning is the “wax on, wax off” scene in the film The Karate Kid. 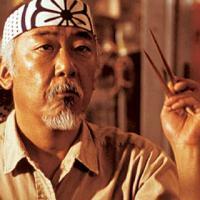 A teenager, Daniel, asks Mr. Miyagi to teach him karate. The martial arts master has Daniel perform what appear to be menial chores, like waxing a car, but Daniel discovers that while he was accomplishing the work, he was also developing the mechanics of karate techniques. The more “formal” karate instruction then involved putting the mechanics together. Following the practice provided the foundation to build deeper understanding. A less physical example of indirect learning is the game app DragonBox Algebra, which leads you through maneuvers involving dragons, eventually substituting symbols for the creatures and teaching the basics of algebra. For someone playing the game, learning algebra might seem daunting, but playing a game involving dragons is much more approachable. Both of these examples illustrate the benefits of indirect learning. By doing something mechanical or fun, you develop new skills without thinking about learning something complex. And most importantly, by focusing on simply doing something different, you overcome any reluctance about change which might have subverted your stated intention to learn something new. “Muscle memory” (or the mental equivalent) frees you up to spend time thinking about how to work better. The learning and growth will only happen if you make the connection later—the “aha!” moment in The Karate Kid, or the transition from dragons to symbols in the algebra game. If you are introducing Scrum to a team, for example, encourage the team to start with a basic and well-defined approach to the various Scrum events (planning, daily standup, and review) and supporting practices (estimation, testing, etc.). After a few days you can explain how the process affected collaboration and delivery, thus providing an “aha” opportunity. Resist the temptation to customize the approach too much for a couple of sprints, until the team has a sense for how the practice adds value and supports Scrum principles. Experiences are a great way to learn, and sometimes they even teach you skills without your realizing it. Principles are important, but it may be easier to learn principles once you’ve been practicing techniques that support them.